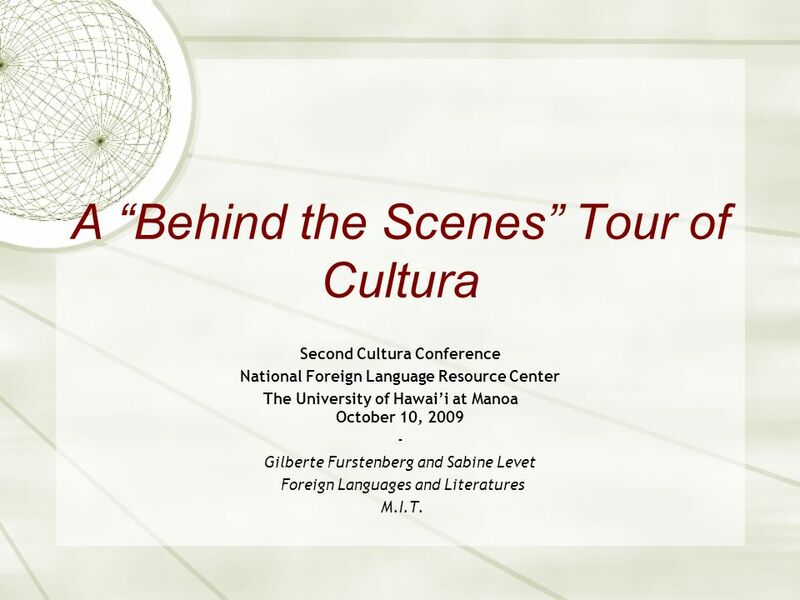 Second Cultura Conference National Foreign Language Resource Center The University of Hawai’i at Manoa	October 10, 2009 - Gilberte Furstenberg and Sabine Levet Foreign Languages and Literatures M.I.T. 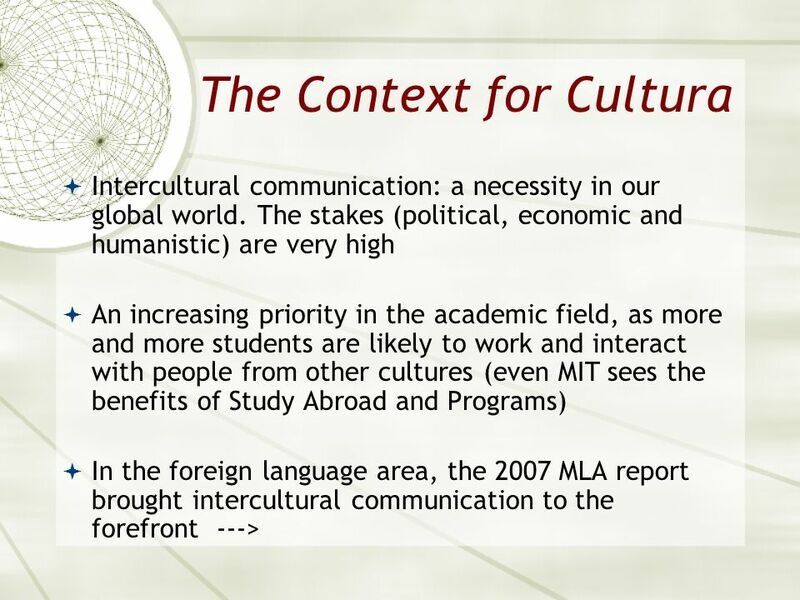 2 Outline The context for Cultura What is Cultura? 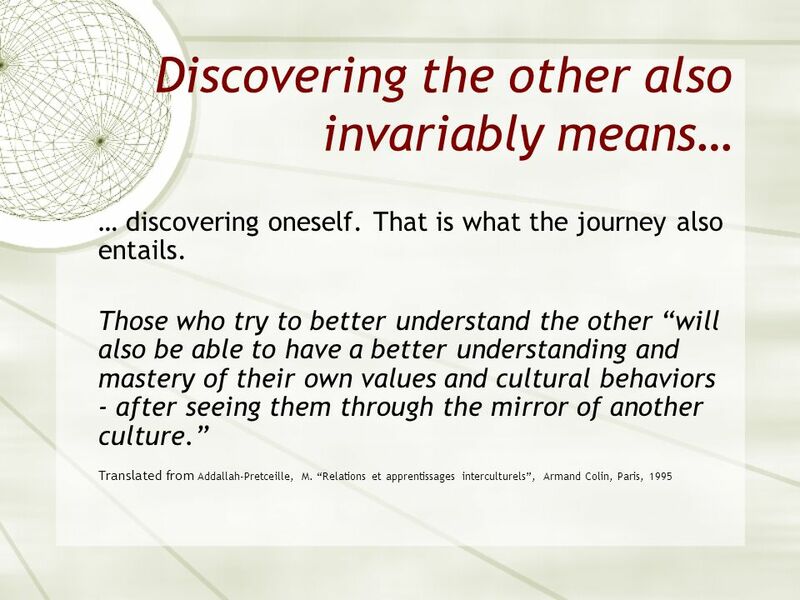 Bring students to understand: the attitudes, values, ways of thinking and interacting of those who live in another culture. Quite a challenge, as this is the “hidden dimension”, the “silent language” of culture (Edward Hall) Big question: how to make that dimension visible? ---> An approach was needed Will not happen on its own. Why those particular aspects of culture?? 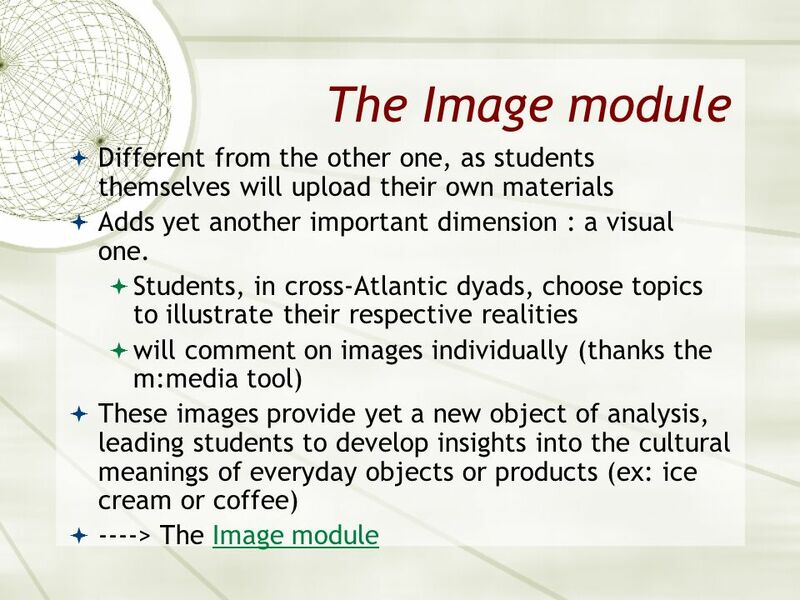 IC needs : to be constructed around an approach and on the basis of materials - that need to be selected in terms of relevance to the field of interest to include some level of reflection (including self-reflection) This is what the Cultura Project offers. 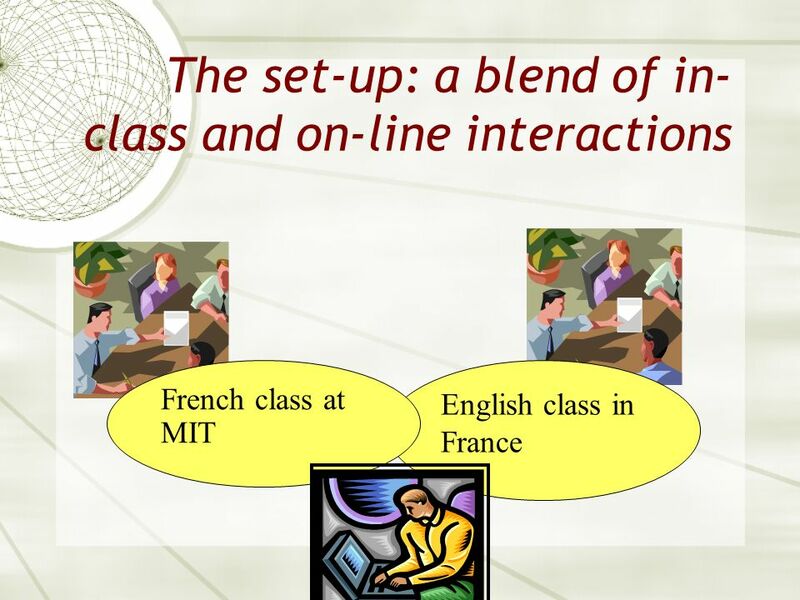 French class at MIT English class in France A hybrid environment: in-class and on-line interactions Slide lent to me by my partner..
… does not automatically develop intercultural communication. 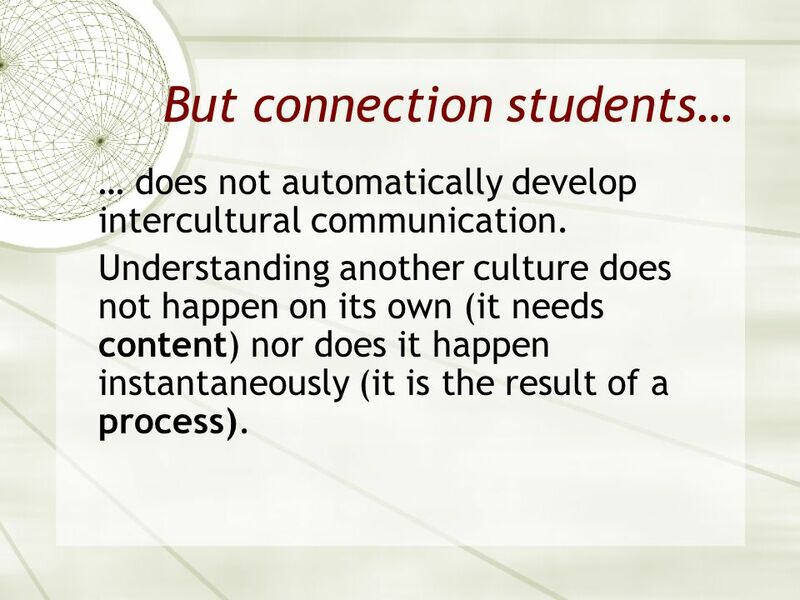 Understanding another culture does not happen on its own (it needs content) nor does it happen instantaneously (it is the result of a process). 10 Cultura can be viewed as a collective journey which students of different cultures embark upon together - a journey that can last a lifetime. A brief description of Cultura: : A collective journey - with students of different cultures gradually constructing together an understanding of each other’s culture, around a set of materials - with the goal of developing a deeper understanding of each other’s cultural It focuses on the process through which students go to acquire a better understanding of the other culture. 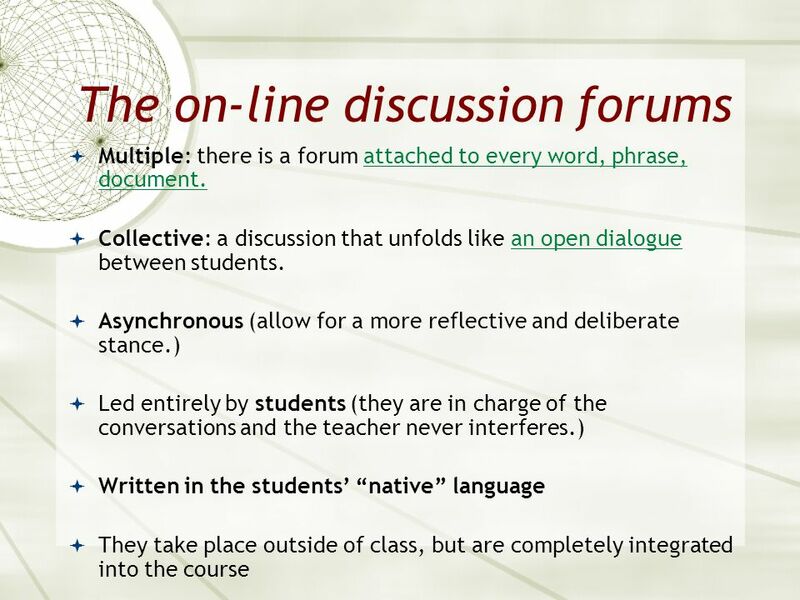 12 Comparing the Answers A comparative analysis of the answers provides the entry point into the respective cultures and the initial basis of the on-line discussion forums. 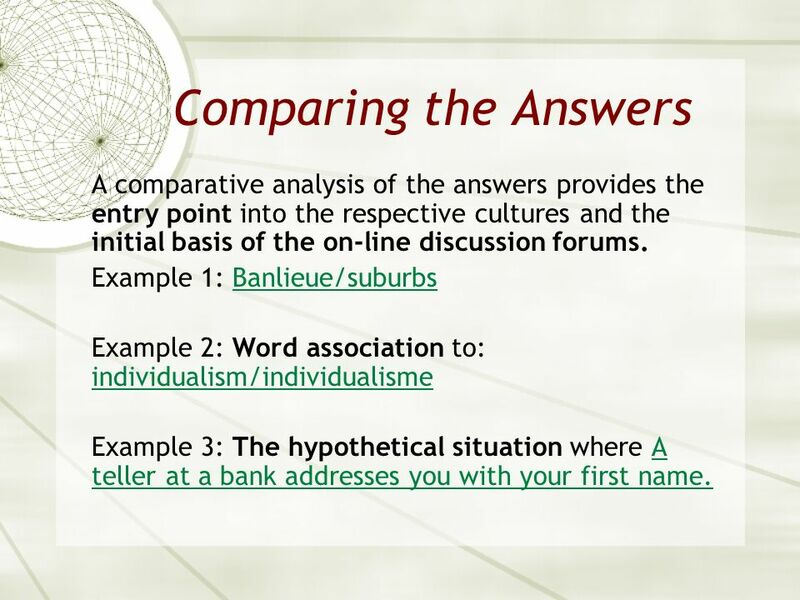 Example 1: Banlieue/suburbs Example 2: Word association to: individualism/individualisme Example 3: The hypothetical situation where A teller at a bank addresses you with your first name. What we show you.. Separately.. But each set of answers is followed by a dedicated discussion One week.. They are at the heart of the process. 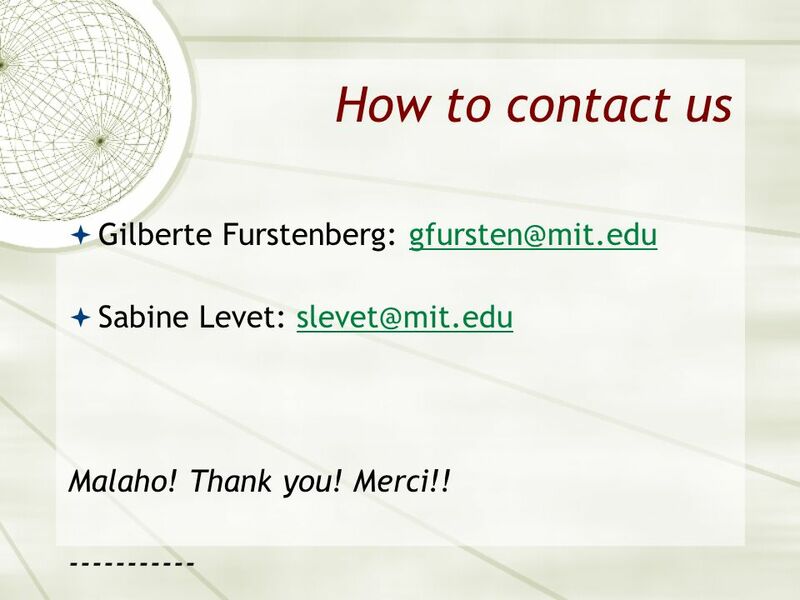 This is where the intercultural communication and reflection take place. 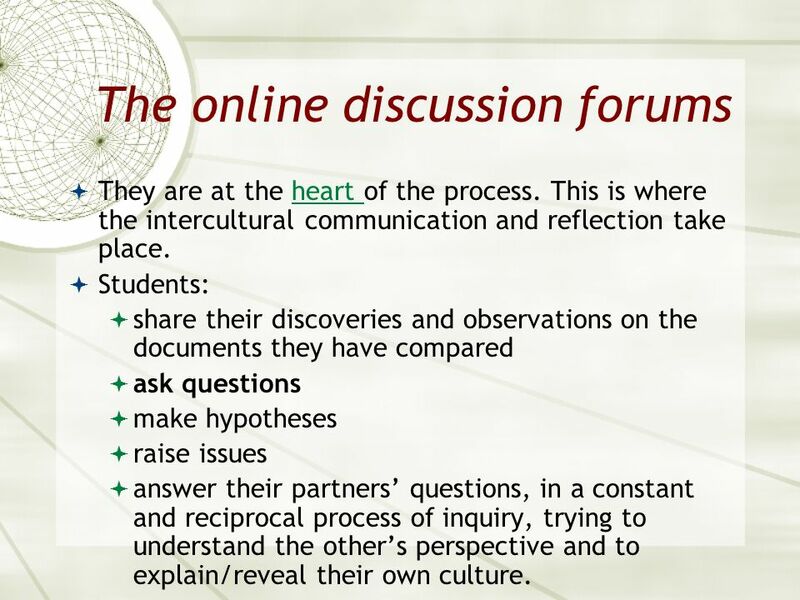 Students: share their discoveries and observations on the documents they have compared ask questions make hypotheses raise issues answer their partners’ questions, in a constant and reciprocal process of inquiry, trying to understand the other’s perspective and to explain/reveal their own culture. We make space for this to happen. This does not mean it is going to happen on its own. 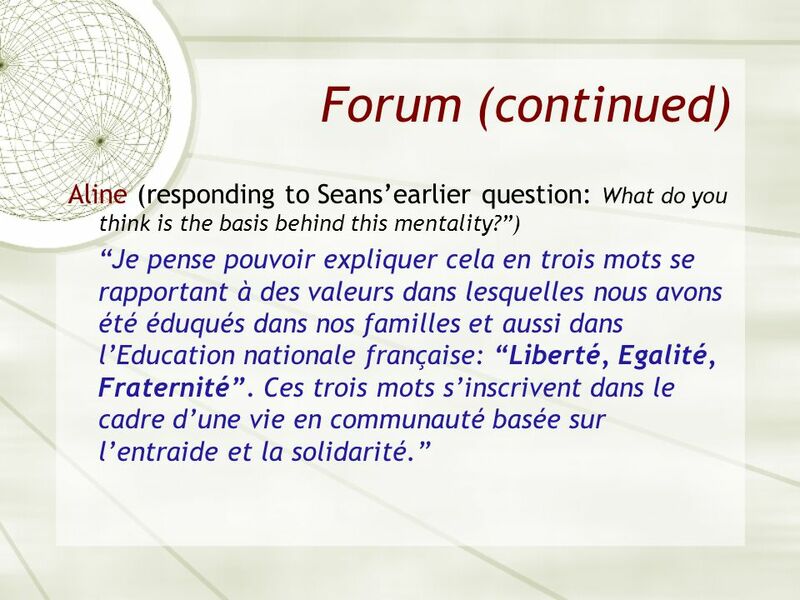 “Merci pour ton explication, Sean. Elle lève le voile sur un malentendu lié au sens même du mot dans nos deux langues. Je pense que ce n’est pas la seule divergence dans nos lexiques respectifs. 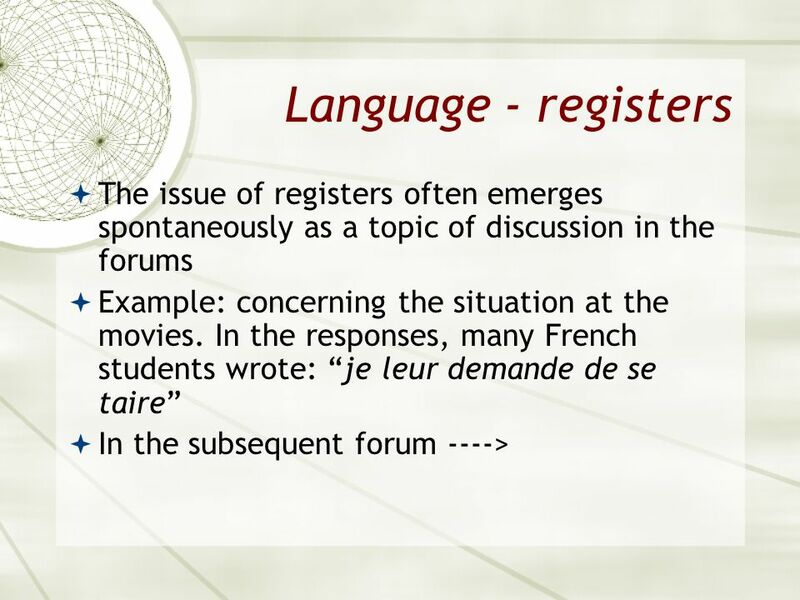 C’est pour cette raison que je vous propose de mettre sur le forum les définitions officielles (française et américaine) de chacun des termes sur lesquels nous ne nous entendons pas?” The dialogue continues. Dictionary as referee? Thank you for your explanation S., it clears up a misunderstanding about the meaning of the word in each language. I think that it is not the only difference in our vocabulary. 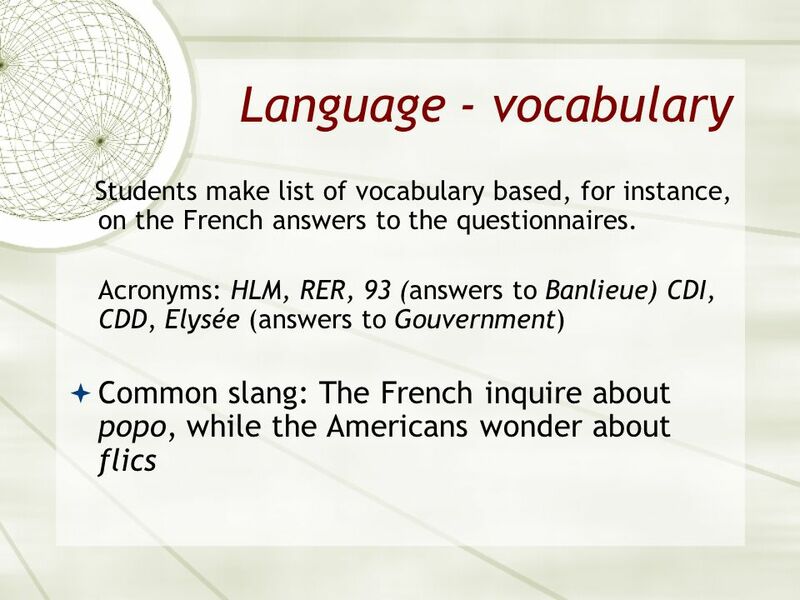 This is why I suggest we post on the forum the official definitions (French and American) of each word about which we disagree. 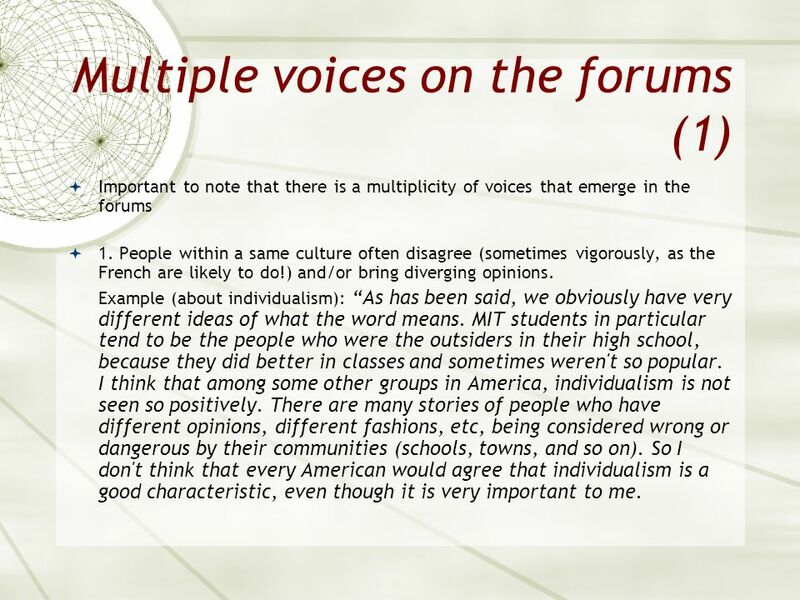 18 Forum (continued) Aline (responding to Seans’earlier question: What do you think is the basis behind this mentality?”) “Je pense pouvoir expliquer cela en trois mots se rapportant à des valeurs dans lesquelles nous avons été éduqués dans nos familles et aussi dans l’Education nationale française: “Liberté, Egalité, Fraternité”. Ces trois mots s’inscrivent dans le cadre d’une vie en communauté basée sur l’entraide et la solidarité.” I think I can explain that [fact], with three words having to do with the values that formed the basis of the education we received, in our families and in the French schooling system: “Liberty, Equality and Fraternity.” These three words define a community life based on helping one another and on solidarity. 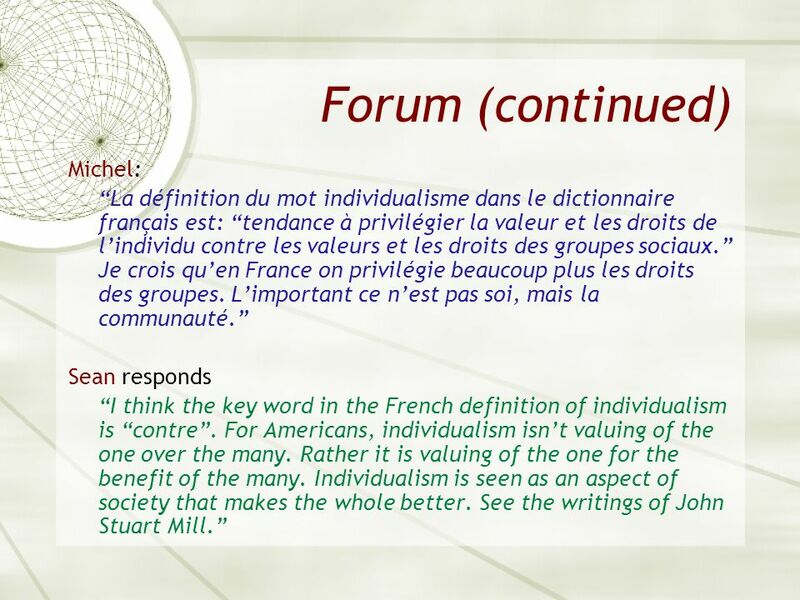 Here, the student adds up to the definition, and expresses some fundamental values: families, French schooling systems, communauté, solidarité. Explaining the French answers to the Americans Room for disagreement and paradox. The very process in which students are involved requires them to keep suspending judgments and be ready to revise them, question them, expand them, refine them in the light of new materials and new perspectives. Last fall especially, when there were many problems in the suburbs, some students wondered about the true life implications of the importance of the community, on solidarity. 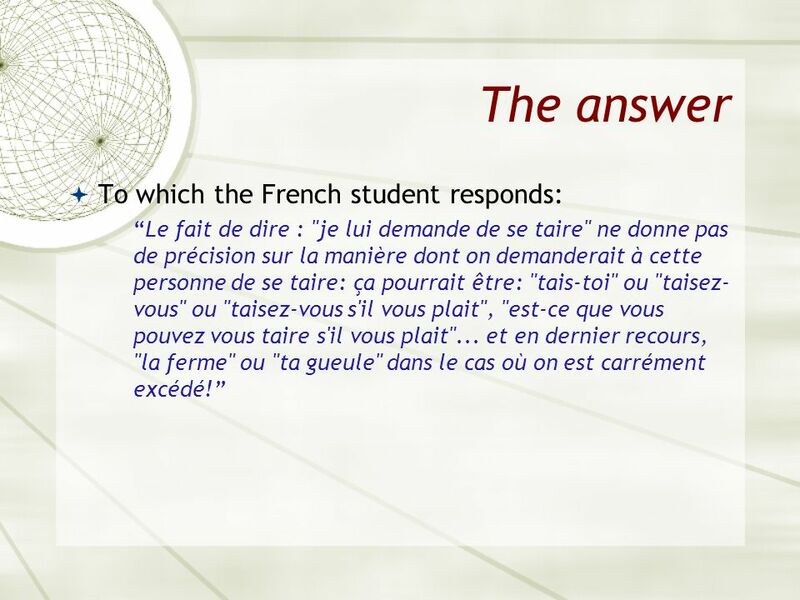 In a forum on France, a student said “sometimes one can wonder if this motto is true. A lot of people in France feel excluded from the society and ignored by the politicians. They feel they are forgotten.showing there is a disconnect between the offical motto and the way people live. 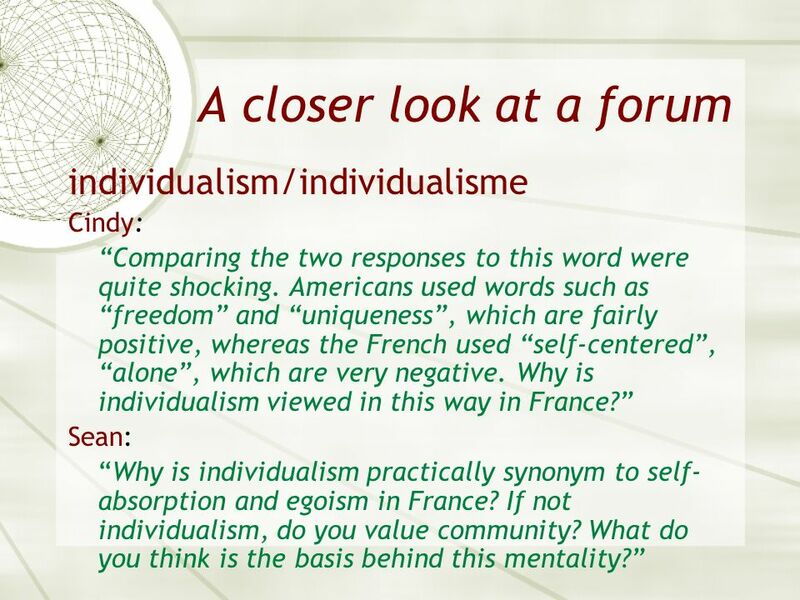 But it enables also the French students to realize, when the conversation moved to the subject of community, that the community is very important for the Americans too, but more on a local level, where each individual talent could benefit all, with the often shared notion of “giving back to the community”..
2. 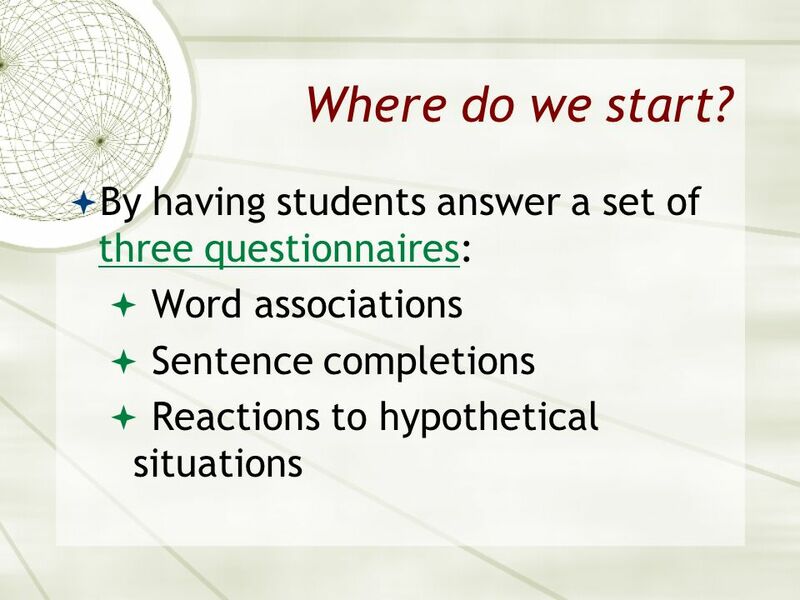 Students come from different backgrounds and also bring their own perspective to the conversation, spontaneously raising the very important notion of context. 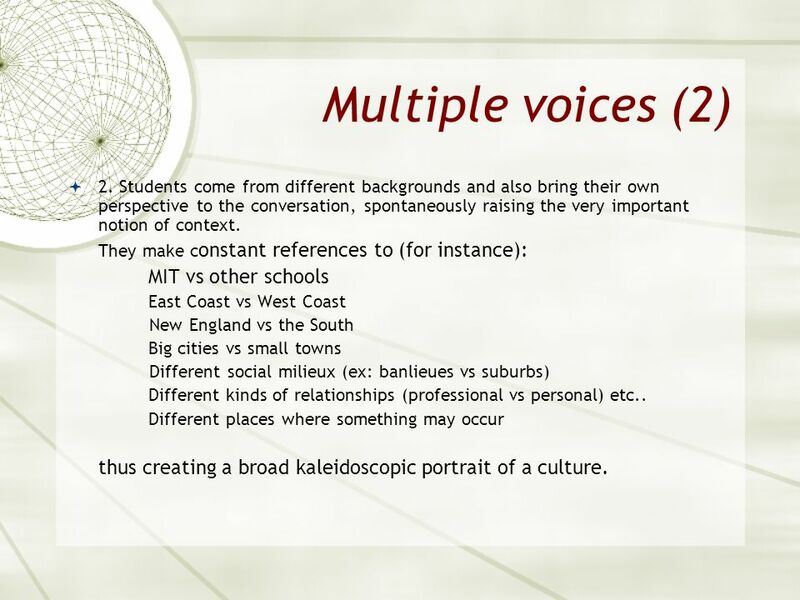 They make constant references to (for instance): MIT vs other schools East Coast vs West Coast New England vs the South Big cities vs small towns Different social milieux (ex: banlieues vs suburbs) Different kinds of relationships (professional vs personal) etc.. Different places where something may occur thus creating a broad kaleidoscopic portrait of a culture. 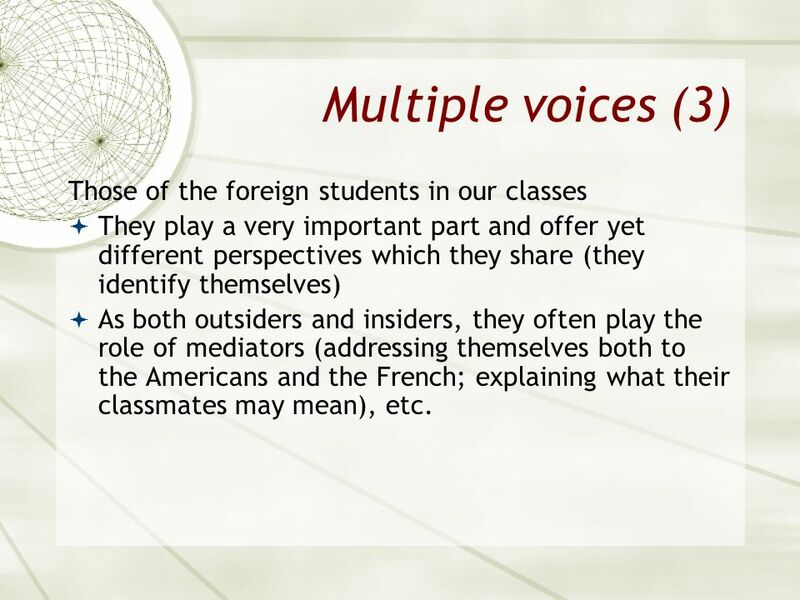 They play a very important part and offer yet different perspectives which they share (they identify themselves) As both outsiders and insiders, they often play the role of mediators (addressing themselves both to the Americans and the French; explaining what their classmates may mean), etc. 25 Is there an end to the journey? Not really. The dynamic process in which students are involved requires them to: - keep suspending judgments about the other culture - and be ready to constantly revise them, question them, expand them, and refine them, in the light of new materials and new perspectives. Harmonize goals and calendars Select relevant and appropriate materials - which need to be varied, interesting, motivating, and sustain interest over the long term. 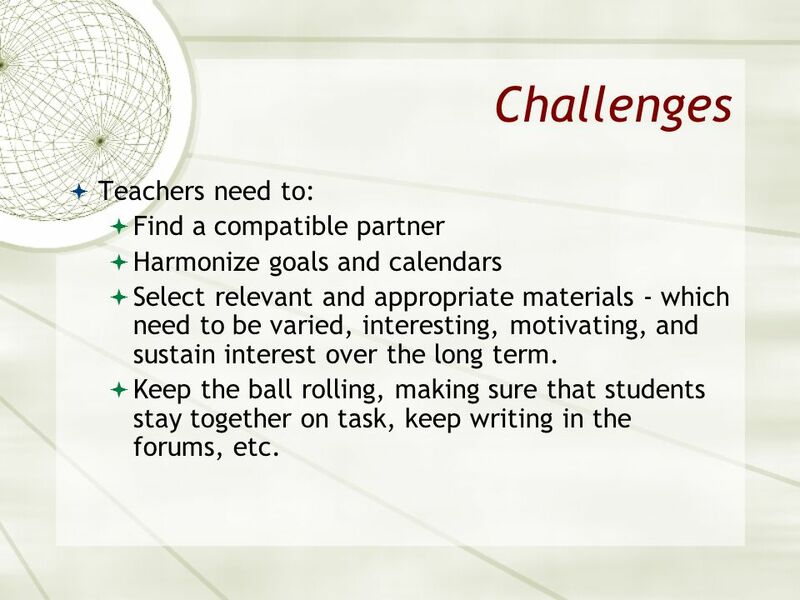 Keep the ball rolling, making sure that students stay together on task, keep writing in the forums, etc. 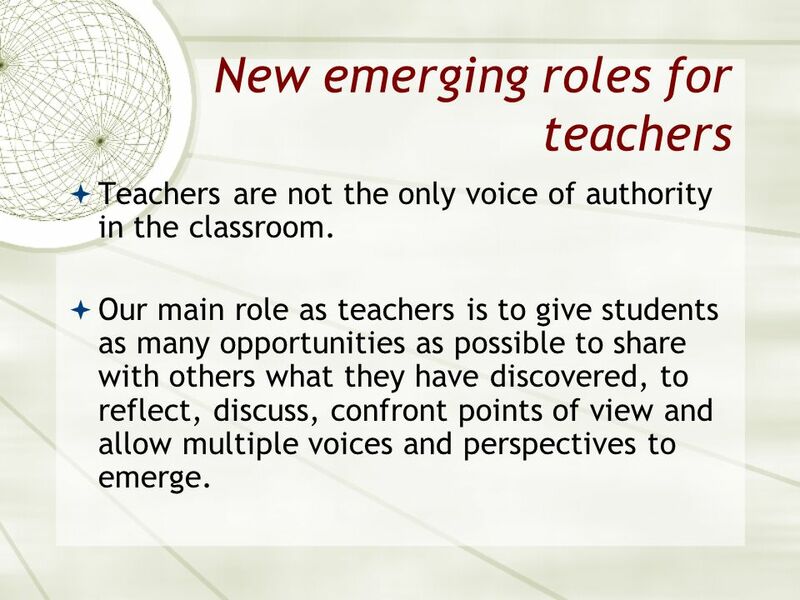 Teachers are not the only voice of authority in the classroom. Our main role as teachers is to give students as many opportunities as possible to share with others what they have discovered, to reflect, discuss, confront points of view and allow multiple voices and perspectives to emerge. 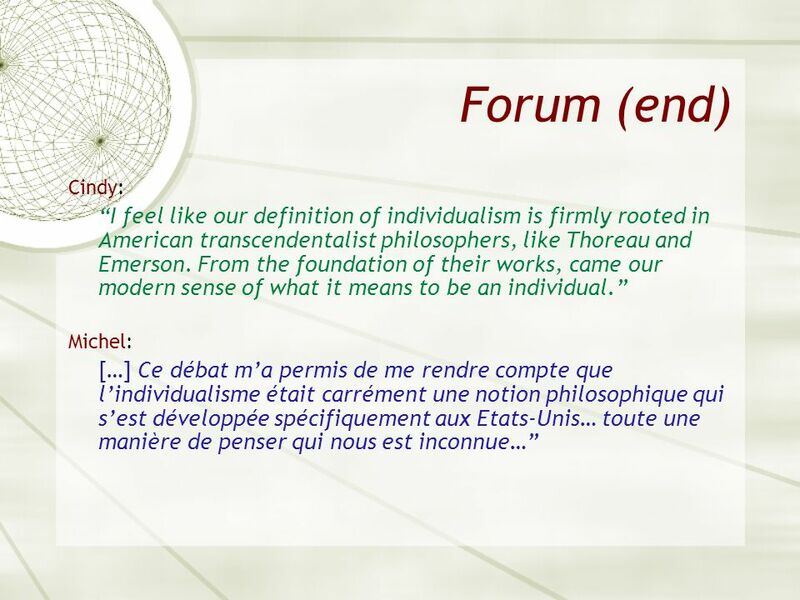 OUI, ET AJOUTER QUELQUE CHOSE DE PLUS SPECIFIQUE SUR COMMENT FAIRE AVANCER LA CONVERSATION (A MOINS QUE CES SLIDES SUR UN NEW ROLE/A NEW KIND) SOIENT EN FAIT UN RECAP… ILS DEVRAIENT AVOIR COMPRIS A CE MOMENT Add speech about reconciling contradictions Sabine?? A new kind of classroom: a highly interactive and dynamic place where students, taking center stage and interacting with their classmates, develop more insights, co-construct and expand their own knowledge and understanding of the subject matter A new kind of learning: such a project obviously clearly brings the process (of constructing knowledge) into the limelight, not the finished product. 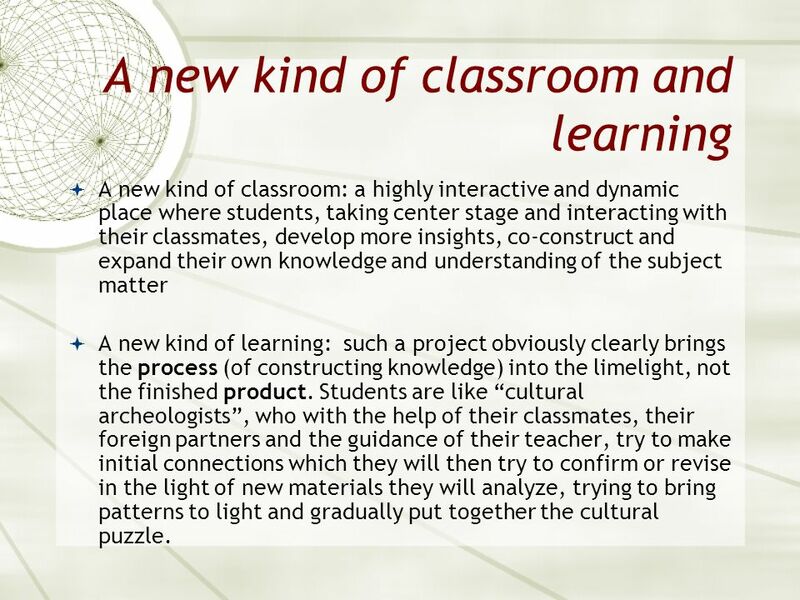 Students are like “cultural archeologists”, who with the help of their classmates, their foreign partners and the guidance of their teacher, try to make initial connections which they will then try to confirm or revise in the light of new materials they will analyze, trying to bring patterns to light and gradually put together the cultural puzzle. Sabine Levet: Malaho! Thank you! Merci!! 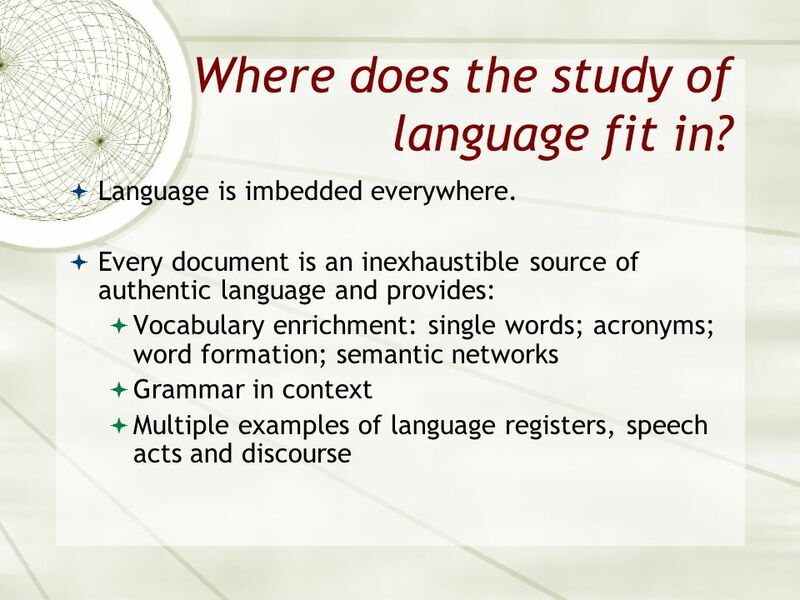 32 Where does the study of language fit in? 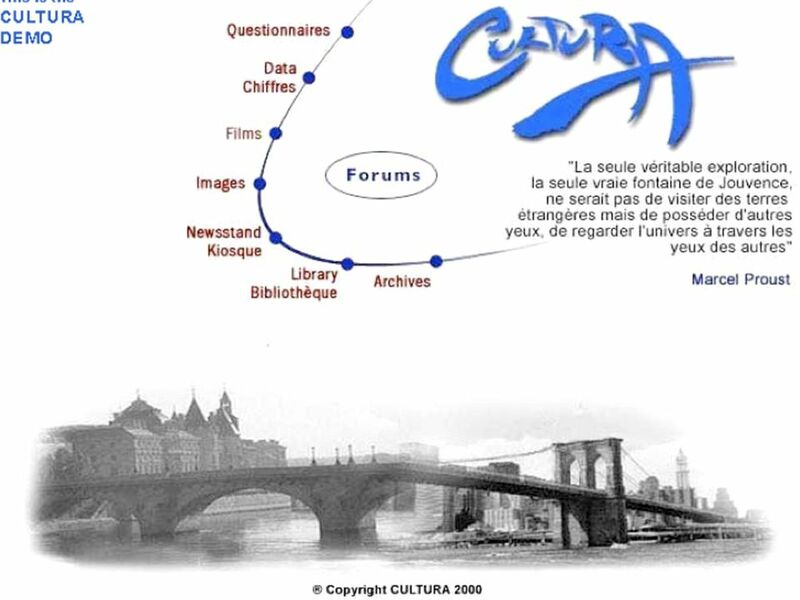 Download ppt "A “Behind the Scenes” Tour of Cultura"
CULTURES in BOXES n°1 France - Turkey An e-twinning project. 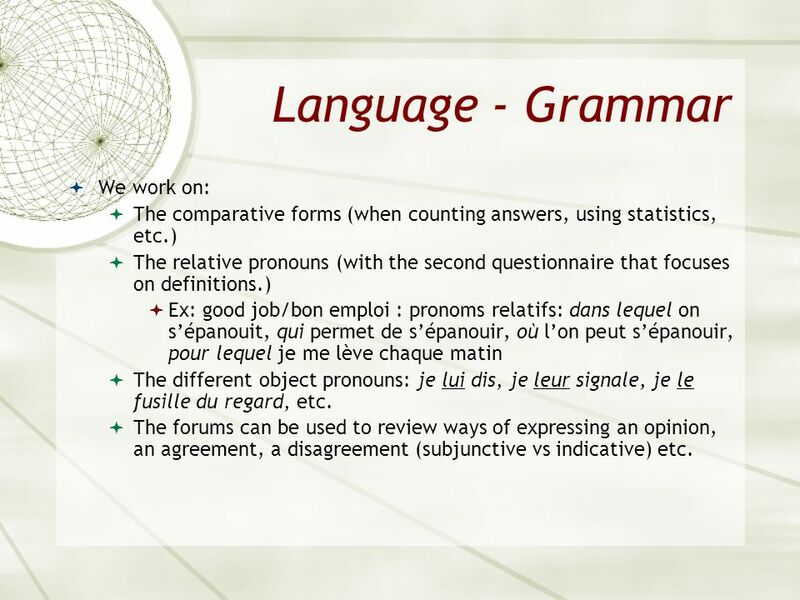 Le pronom en replaces a noun indicating a location, a thing, an idea, or a person. How to express points of view, agree and disagree, and give evidence to support a point. 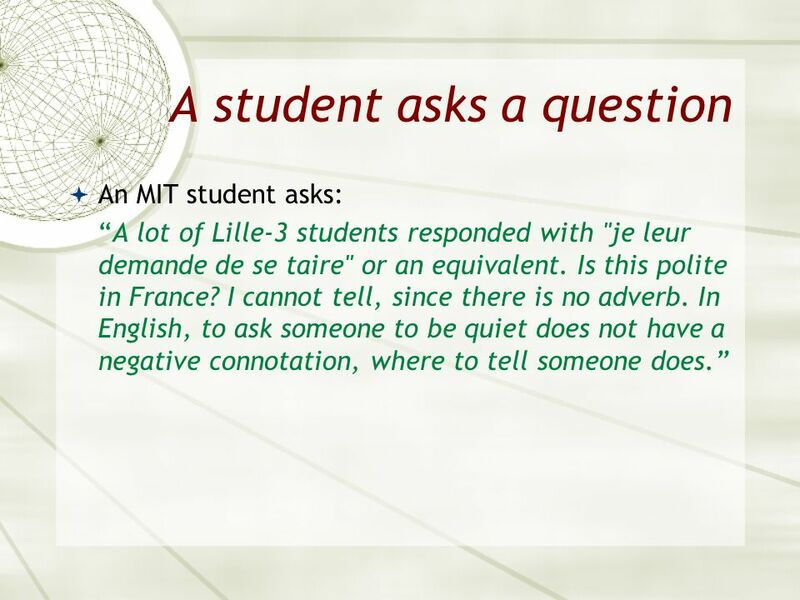 Debating skills in French. Où habites-tu? WILF: WALT: BE ABLE TO DESCRIBE WHERE I LIVE. Do Now Choose the correct word to complete the sentence. 1. An architect is someone who/which designs building. 2. A vacuum cleaner is something that/whose. Ulla Lundgren School of Education and Communication Jönköping University SWEDEN TRANS-ATLANTIC TALK An asynchronous web-mediated. The Middle Years Programme. International Baccalaureate and the Middle School of the Kennebunks Date IB World School since June, 2009. 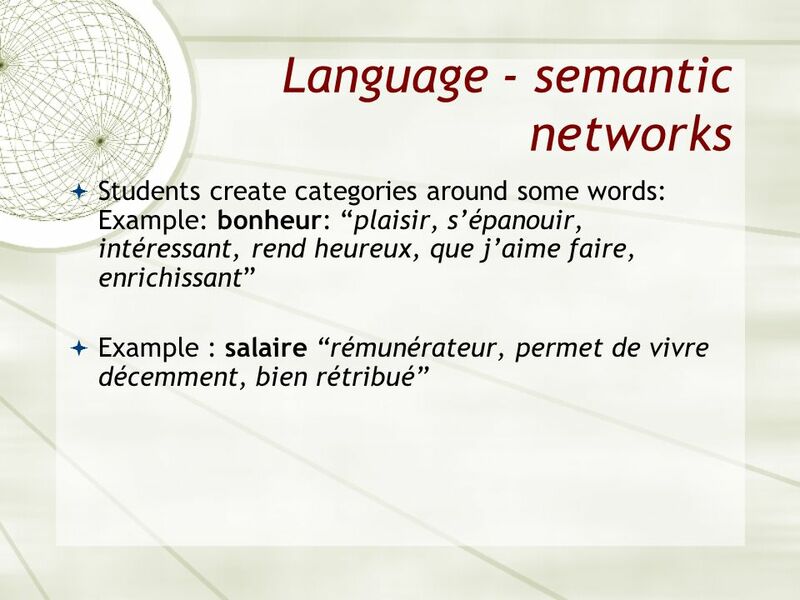 LANGUAGE LEARNING AND THE INTERNET. 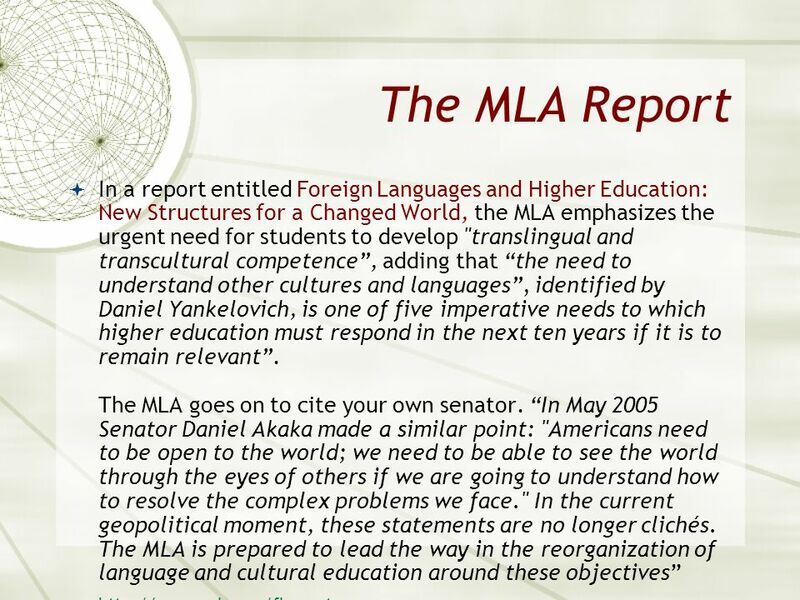  The communicative possibilities of the internet have been seized by those who deal in the teaching of languages. How to differentiate for a variety of skill levels and keep everyone happy, engaged or, at least, in the same parking lot. Microsoft Corporation Teaching with Technology. Ice Breaker.